COAST - Fighting for the taxpayers, not working against them! 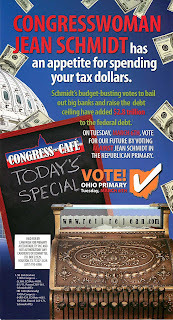 : 7th SuperPAC Mailer on Schmidt hits -- Feeding Frenzy! 7th SuperPAC Mailer on Schmidt hits -- Feeding Frenzy! Oh, yeah, Jean Schmidt has had a feeding frenzy of spending and debt since she got to Congress. The Campaign for Primary Accountability tags it nicely! These guys are good. Thanks for the help!! !